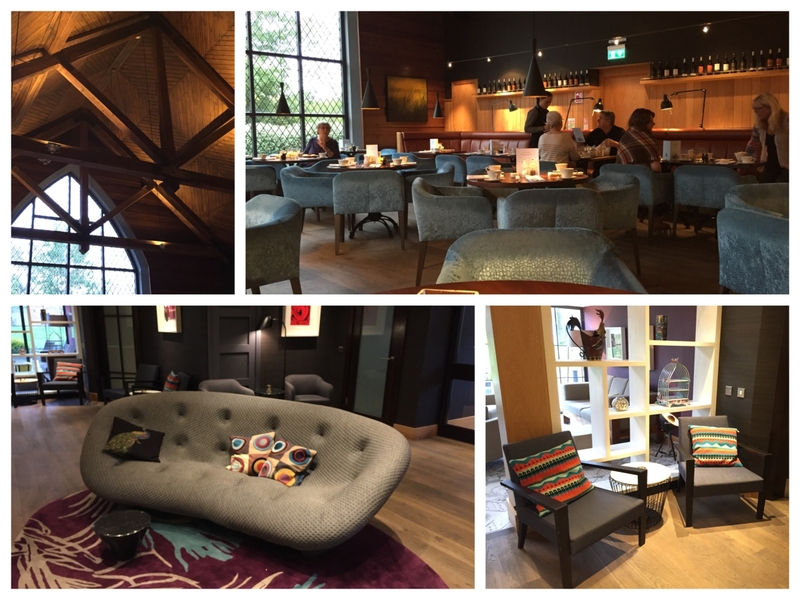 A couple of weeks ago we were invited along to the 4 Star Clandeboye Lodge Hotel in Bangor to visit the Coq & Bull Brasserie. 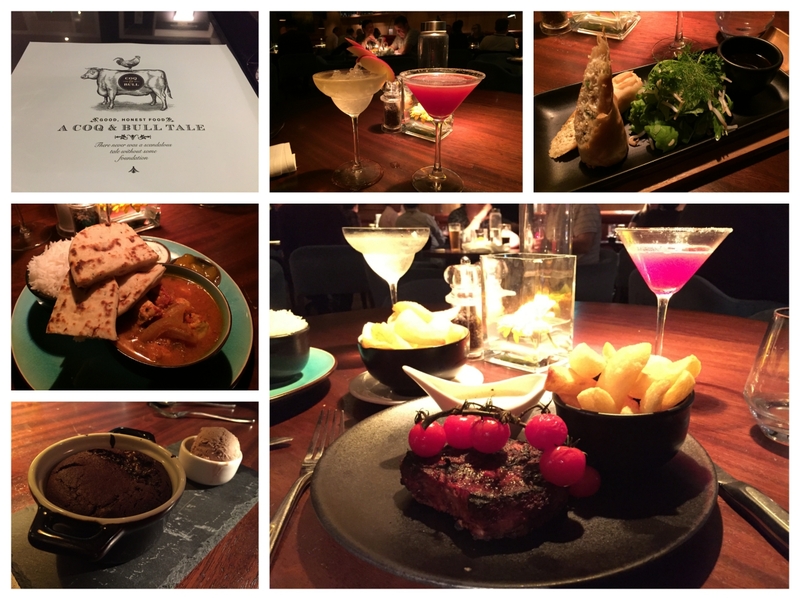 We hadn’t been to Bangor in a long time and it was our first time visiting both the Clandeboye and the Coq & Bull Brasserie so we didn’t really know what to expect. It turned out to be a very special day for us as we had our 12 week scan earlier in the morning and are delighted to announce we are expecting our first child (but we’ll share more about this in a future blog). 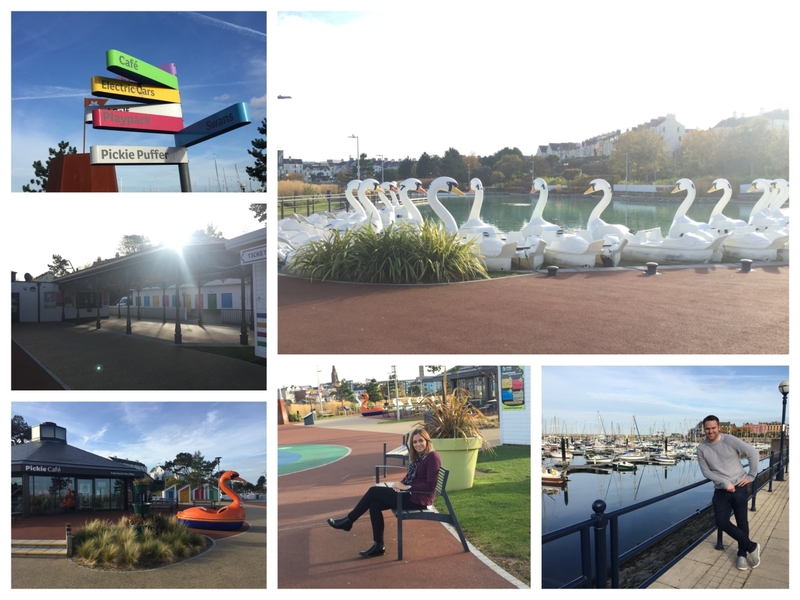 As we made our way from Belfast to the Clandeboye, we took the opportunity to head on into Bangor to check out the Marina and take a walk around the town. It was a wonderfully mild autumn afternoon, so it was a good excuse to get out and take in the sea air (not that we need one, living in Newcastle). 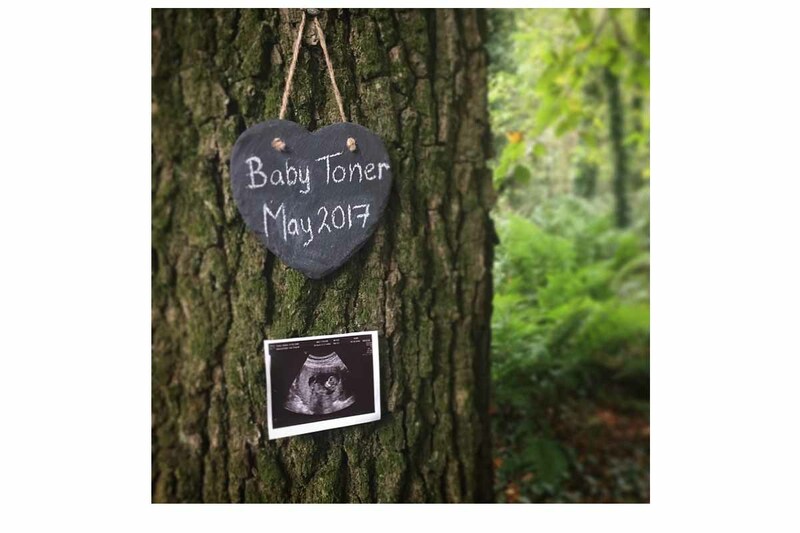 Having spent a bit of time reminiscing at the Pickie Park and Marina, we made the short trip to the Clandeboye Lodge Hotel and we were delighted with everything the evening had in store for us, and we will certainly be back to the Clandeboye once baby Toner arrives in 2017. Before checking into the hotel, we took a short walk around the area and found the perfect location to take a photo to announce our pregnancy news to family and friends, and online followers of Pikalily. As we arrived at the Clandeboye, we received a warm welcome at reception, and found out that we had been upgraded to one of the Bridal Suites at the hotel. As we were in an already celebratory mood, this was the icing on the cake, and was quickly followed by the cherry on top when the hotel sent a glass of bubbly and an alcohol-free cocktail to our room, as a toast to our baby news. 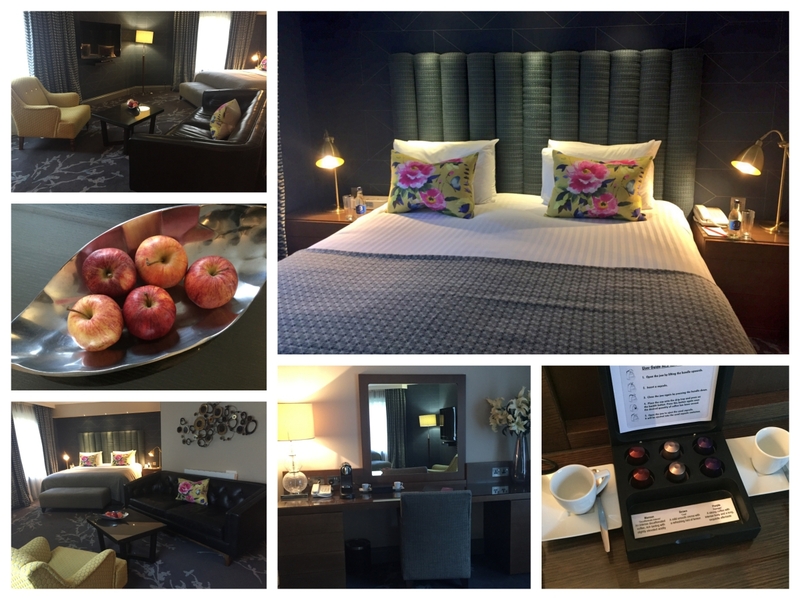 When we checked into our room, we did the usual quick look around to gauge first impressions, and the room certainly did not disappoint. The room was beautifully designed with contemporary finishes and had a real luxury look and feel about it. The dark hues with bright accents created a really relaxing vibe in the room. Along with all the usual hotel room amenities, the bridal suite at the Clandeboye had a comfortable seating area, blackout curtains, a Nespresso coffee machine (which Nial sampled his first ever Nespresso from) and a King-size bed with a posturepedic mattress. The mattress was fabulous and we slept like babies! 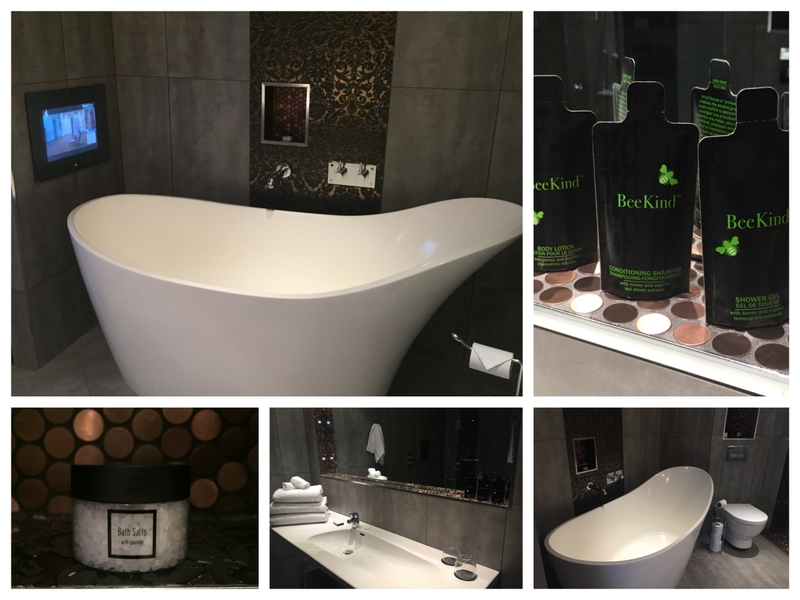 The large en-suite bathroom epitomised luxury, and has certainly provided us with plenty of inspiration when it comes to designing our own bathroom when we begin building our new home next year. None more so than the built in TV at the foot of the bath, which Nial had instantly noted down as a must have. Speaking of the bath, this free-standing, deep-soak limestone bath was incredible. Possibly the deepest and most comfortable bath that we’ve ever come across in a hotel. In fact Helen couldn’t wait I test it out and soak in it after dinner. The en-suite also had a large headed rain shower and double sink, and the choice of tiles and finishes exemplified luxury. Indeed, there was a really sleek and stylish finish to the decor throughout the hotel, including the sophisticated lounge area beside the bar. It had been a while from we had eaten, so once we got settled into the room we ordered a club sandwich from room service to tie us over until our meal later in the evening. 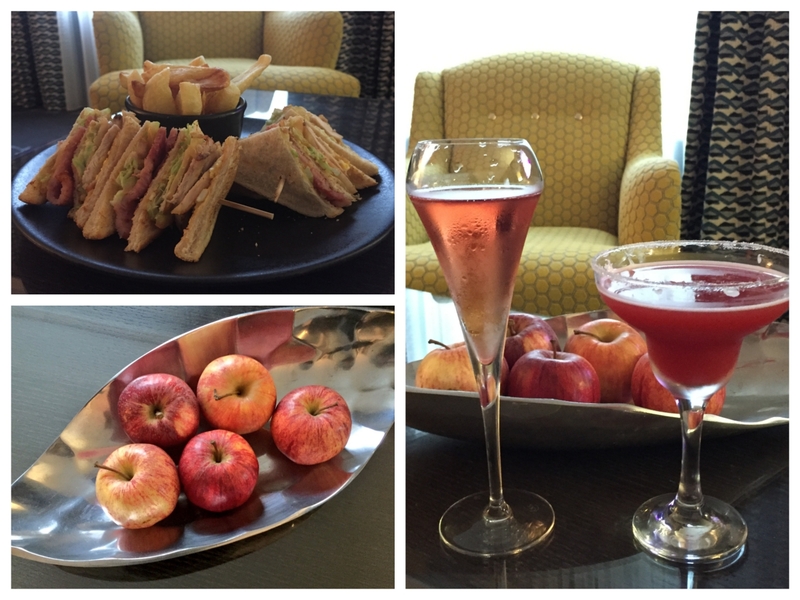 This snack certainly hit the spot, and we spent the next few hours just relaxing in the room before getting ready for our evening meal in the downstairs brasserie. 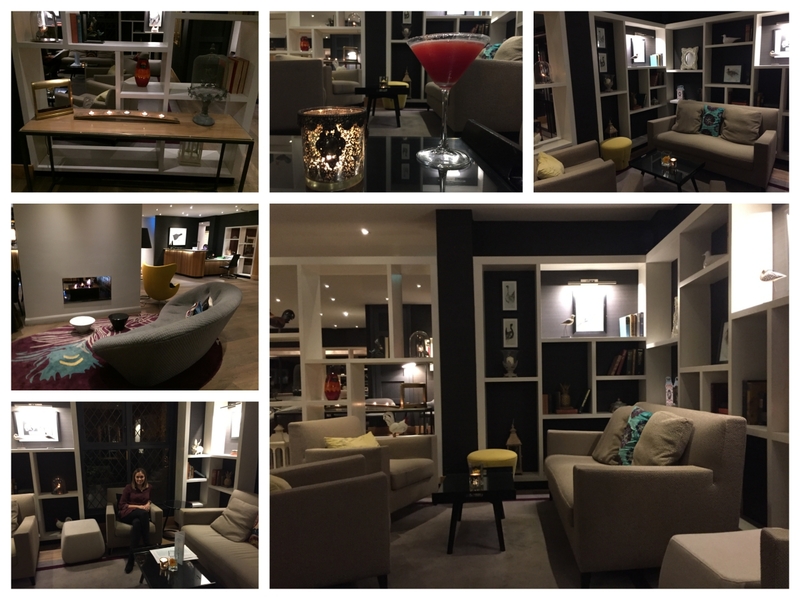 We left our room and headed downstairs to the Coq & Bull Brasserie which is located at the entrance to the Clandeboye Lodge Hotel. We took a seat in the lounge area to enjoy a drink before being seated in the brasserie. The staff in both the brasserie and the hotel itself were fantastic throughout our stay, and the attention to detail was second to none. A really friendly group of people, which makes such a big difference when you are away at a hotel or restaurant. We’ll be covering our dining experience at the Coq & Bull Brasserie in more detail in our next blog, but the meal was a real winner. From the starter of white crab spring roll with a citrus and herb salad, and a chilli and corriander dipping sauce, to the chicken vindal curry and chargrilled fillet steak mains, the food really hit the spot and it was clean plates all round. We finished the evening by enjoying the signature dessert, a hot chocolate and salted caramel pudding with chocolate salted caramel ice-cream, which came highly recommended by our waiter. Gooey chocolate, and salted caramel, what’s not to like!! The dining experience at Coq & Bull Brasserie was extremely relaxed, and the room was filled with diners throughout our meal, a sign that it’s a hit with the locals too. Top quality food and service was the perfect way to finish what had been an excellent day at the Clandeboye. We called it a night, and resided back to our amazing suite for a comfortable night’s sleep. We don’t always get a chance to get a lie in on the weekend, and this is only going to intensify once baby Toner comes along in May, but the blackout curtains and posturepedic mattress in the room helped us enjoy a great sleep, and really set us up for the day. We had been asked at check-in if we wanted a glass of orange juice sent to the room in the morning, and sure enough, two lovely, chilled glasses arrived bang on time at 8.00am. We took the opportunity to just chillout in front of the TV with our freshly squeezed orange juice, before getting ready to head down to the brasserie to enjoy breakfast. 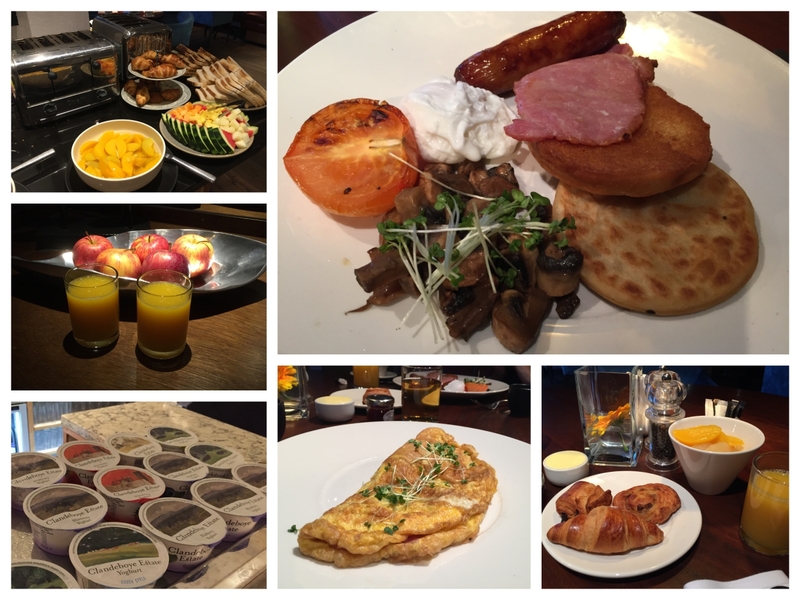 Once again, the staff at the brasserie were superb, and as we arrived down we helped ourselves to some of the continental breakfast offerings before taking our seats to order a cooked breakfast and an omelette. The food was on the money once again, and we finished our breakfast with a Clandeboye yoghurt from the neighbouring Clandeboye Estate. After breakfast we took a walk round the grounds of the hotel and relaxed in the library before grabbing our clothes and checking out. The whole experience was incredible and we will certainly be back to the Clandeboye in the near future. Indeed, the hotel is well placed to explore the North Down area or head into Belfast for the day, meaning guests have plenty of options when it comes to things to see and do. Below we look at a number of things to consider. While the Clandeboye is just a short drive into Bangor, it’s also located near the popular towns of Holywood and Newtownards, allowing you to explore some of County Down’s most popular attractions including Mount Stewart and Scrabo Tower in Newtownards and Castle Espie in Comber. The Ulster Folk and Transport Museum in Cultra, and Holywood Golf Course, Holywood (home of Rory McIlroy) can also keep you occupied for a few hours while visiting the Clandeboye. Should you want to venture further into Belfast we’d recommend checking out the shops at Victoria Square, and experiencing St George’s Market, the Ulster Museum and the Titantic Visitor Centre. 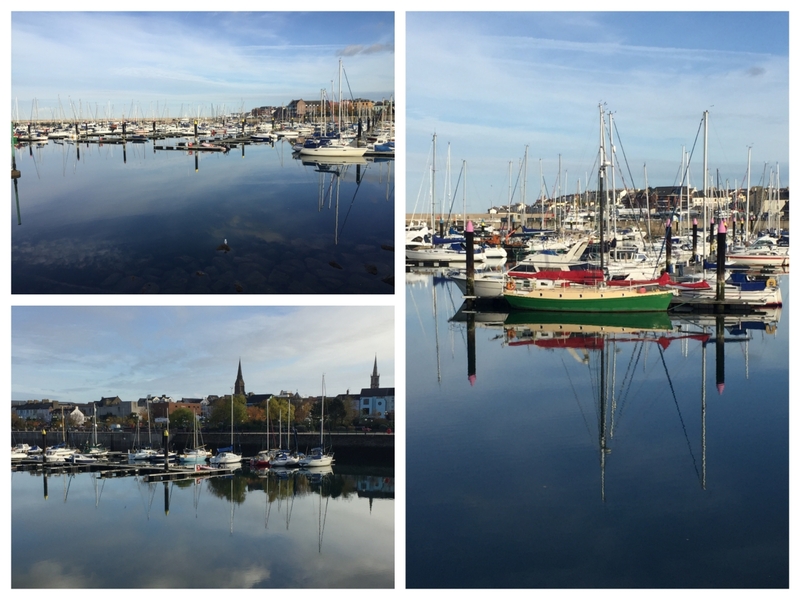 Bangor is also part of the St Patrick’s Trail, a driving route that takes you on a pilgrimage through areas in Northern Ireland that hold a significance to St Patrick. The main sites in Bangor on the trail are Bangor Abbey and the North Down Museum, while Comber Stones, Holywood Priory and Movilla Abbey are also nearby. 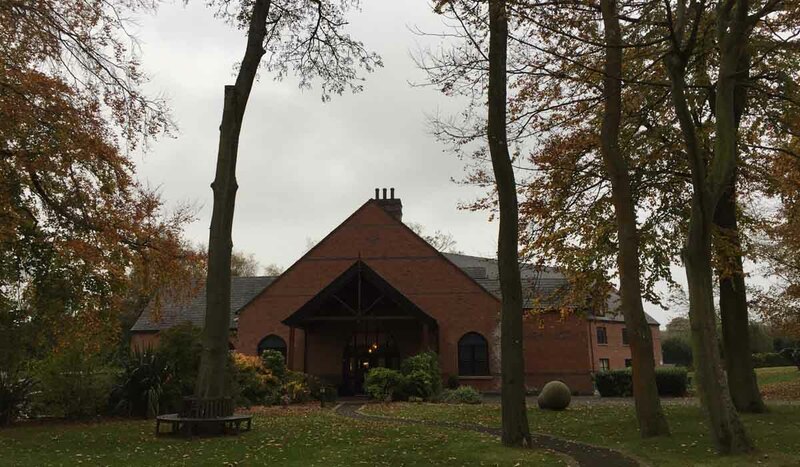 Have you ever visited the Clandeboye Lodge Hotel or Coq & Bull Brasserie? We’d love to know how you got on and what you thought of it. Let us know by commenting below or connecting with us over on Facebook or Twitter.